Besides straight teeth, what are the benefits of braces? Everyone wants a naturally aligned and beautiful smile, and it is no secret that orthodontic braces from Diane Milberg DDS can help deliver one. However, there are greater benefits to wearing braces than just having straight teeth. You’ll gain many oral health benefits in addition to the cosmetic ones. Crooked or crowded teeth may overlap each other and create tight spaces in between. These can make it very difficult to brush and floss effectively, allowing bacteria and plaque to build up, and eventually leading to tooth decay and gum disease. With orthodontic treatment, your teeth will become properly aligned and spaced, which allows for more effective brushing. Your teeth play an essential role in speech. When they are out of line or lean too far forward or backward, this can affect your speaking patterns, and possibly cause embarrassment and frustration. 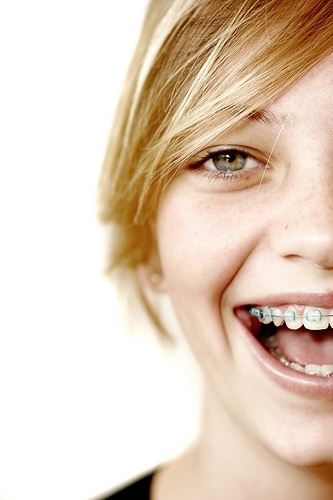 Braces can readjust the positioning of the teeth to allow for clearer, more professional speech. Bone and gum tissues begin to erode when there are no teeth to support. This is also true for poorly aligned teeth that leave gaps and spaces or place too much pressure on the jawbone due to a bad bite. With braces, the bones and tissues are less likely to erode and can continue to support the teeth in their new alignment. Your teeth play an important role in digestion. Before food ever enters your stomach, it has been partially digested by the teeth. If teeth are severely out of line, however, they may not play their role in breaking down food as effectively as they should. With braces, your teeth will be straightened into optimal alignment for eating and chewing. Dr. Diane Milberg and staff will be happy to answer any of your questions about your orthodontic treatment. Visit us in San Diego, California today! To schedule an appointment, please complete and submit the request form below. Our scheduling coordinator will contact you soon to confirm your appointment.